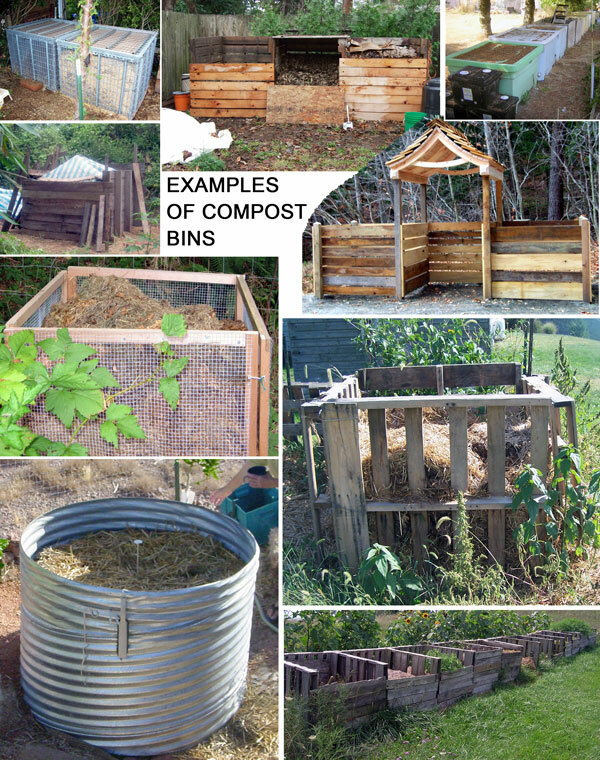 The Humanure Handbook - Building a humanure compost bin. Humanure Handbook also available as an E-Book! Post holes were dug and 3 inch by 4 inch black locust posts were set in a mixture of dry concrete and soil, moistened and packed down. With the posts set and braced, black locust boards are screwed to the posts to provide the bin's walls. The bins take shape as more boards are added to the sides (above). 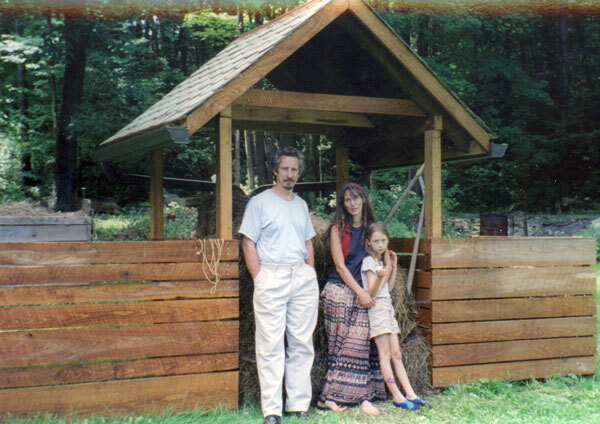 Rafters, made of recycled hemlock, are cut by Joe Jenkins and step-son Brent Ulisky and notched with a bird's mouth to rest on the horizontal beams (below). Salvaged boards from a demolished barn serve as sheathing for the roof (above). Note the 20 year old humanure compost bin in the background, built for nothing out of recycled materials, but now getting a bit dilapidated. 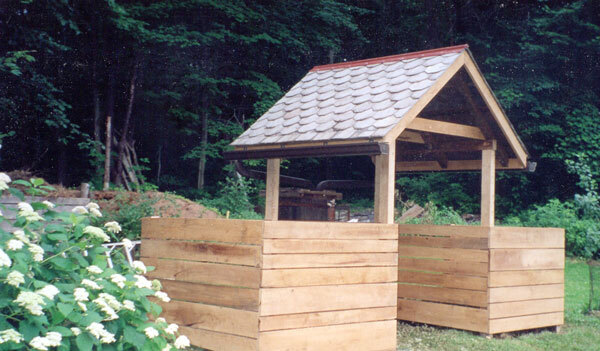 The sheltered middle bin, used to store cover materials, is roofed with reclaimed slate. You can just see the top of a sawdust pile behind the Hacienda (left side of photo). The sawdust is used in the toilet system. Gutters and downspouts route rainwater into a collection barrel (above). The rainwater is used to clean compost buckets. 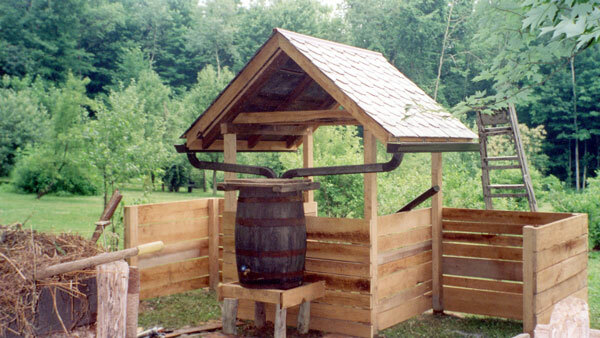 The rinse water is deposited on the compost pile. The Humanure Hacienda, newly built (below). Steaming compost pile (below). This pile was being dug and videotaped by the same person at the same time - shovel in one hand and camera in the other, so it's a little shaky. The Hacienda after 2 years of use (below). Note location of house and garden in left photo. House is behind the compost bins and to the right, garden is behind and to the left. Chicken house slate roof is visible at edge of garden (far left of top left photo, in back). 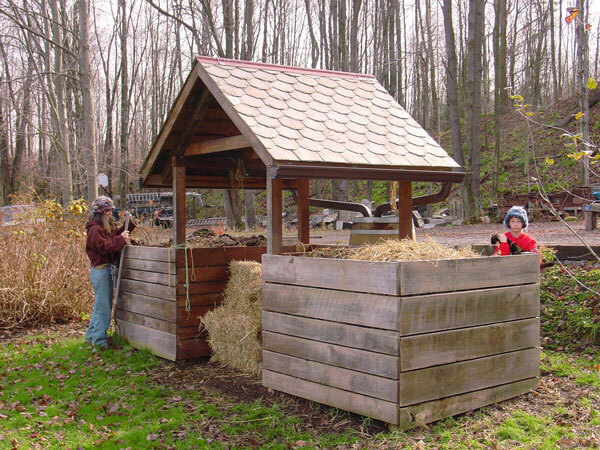 Despite the fact that the compost bins are filled with toilet material, there is no odor whatsoever emanating from this composting system. The right bin contains aging compost from the prior year. It will be used in the following spring and the active (left) bin will then be put to rest for a year (becoming the aging bin). The cycle continues in this way indefinitely. You can read more about it in the Humanure Handbook. 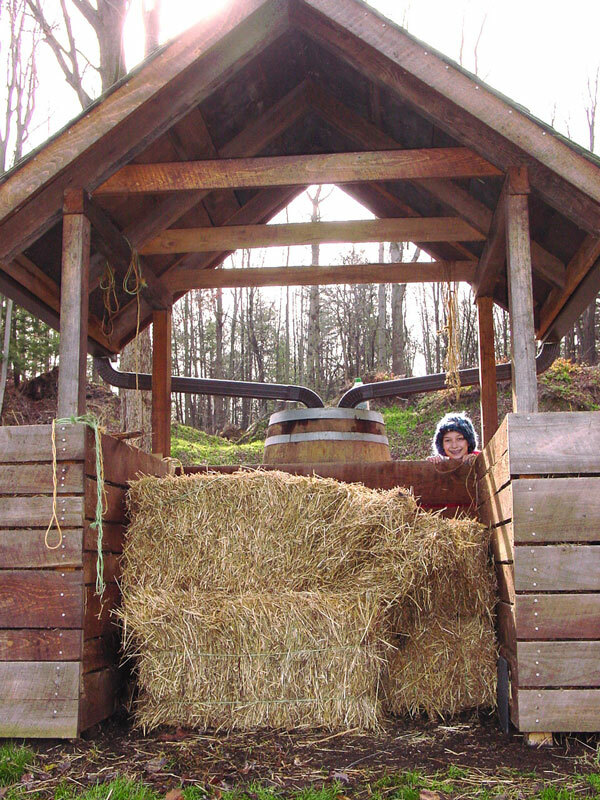 Center bin is used for storage of cover materials (above); in this case, hay bales for the winter.